in bolted connections, braze joints, weld seams in outdoor and indoor switchgears up to 750 kV in conditions of intense and highly complex electromagnetic environments. MIKO-21 is ahead of similar devices represented on the market due to a number of functional and technical features. For example, special measuring technologies ensure MIKO-21 compliance with the most stringent accuracy requirements. MIKO-21 is ideally applicable for high-precision resistance tests in the µΩ range. One of the problems during transient resistance measurement with permissible error is availability of oxide films between contact surfaces. According to international standard IEC 60694: General Specifications for High-Voltage Switch Gears (International Electrotechnical Commission), to control this type of error test current amperage during testing the electric resistance in the main circuit of a HV circuit breaker shall be between 50A and its rated value. Test current in foreign circuit breakers is often limited by specific values: 100 A and 200 A.
Manual mode for setting test current in the range from 1 to 200 A at a step of 1 A.
SKB EP microohmmeters are the only instruments enabling to measure contact resistance of live tank and dead tank circuit breakers using separate automatic modes optimized for those circuit breakers. Mode 3 enables to operate measurement in the circuits with CT using 100 A or 200 A current (set by a user) without saving the battery power. Current transformers of bulk-oil circuit breakers form an extended transition process when test current is applied. Due to that measurement time is determined by parameters of CTs, their number, and test current. For example, for HV oil circuit breaker measurement time may be up to 30 seconds. MIKO-21 special algorithms with automatic measurement stop prevent subjective errors and increase number of measurements per one battery charge. Single is launched once the cable clamps are contacted to the tested object and followed by pressing the START button. Auto single circuit is initiated by pressing the START button. The instrument will start measurement when the electric contact between the tested circuit and the test cable contacts is set. The test can be repeated by pressing the START button again. Periodic is used in pre-specified time intervals when both hands are occupied with cable probes pressing against the test points. The user can choose time interval between the tests. The instrument will work continuously until the user stops the mode. Auto periodic circuit is initiated by pressing the START button and used for continious measurements. The user connects the current cable, and as soon as the potential contacts are connected, the measurement will start automatically. To repeat a test, simply break contact with potential probes and reconnect. Archive of company's circuit breakers contact resistance passport values ensures automatic comparison between measured and passport values when the trademark of the circuit breaker is specified. Archive of the instrument contains passports of HV circuit breakers with indication of maximum and/or minimum permissible contact resistance. The user can add, delete or edit passport values of the tested objects. The user can also add the required template. Once the measured value exceeds the passport value the instrument indicates it acoustically. Automatic storage of measurement results significantly reduces time of the circuit breakers test due to transfer of the data from the substation to the company's office. Availability of an in-built archive of passport values of eclectic resistances (main circuit of HV circuit breakers) facilitates automatic detection, and the device beeps if the results of measurements go beyond the permissible limits. Color graphic display of high brightness ensures easy reading on a sunny day, whereas intuitively understandable interface with a multi-sensor display simplifies the instrument use. The Instrument can be manipulated either from the film keyboard or from the multi-sensor display, as suits. Communication with PC via USB or a flash card facilitates data transfer from the Instrument to the Company's data base. The device can be integrated into measuring systems under PC control of diagnostic laboratories and companies producing electric equipment. Availability of an energy-independent memory and a mode of "automatic storage of the results of measurements" considerably reduces the full time of the circuit breaker test owing to transfer of the data obtained from the substation area to the Company's office. The above peculiarities ensure complete independence and high mobility of the instrument over the vast substation or workshop territory as you avoid troubles with a power cable, extension rod to the socket, and grounding. For convenience the standard kit includes only one type of a test package (Kit 3 includes two test cables with crocodile clips for high-voltage circuit breakers up to 110 kV). One set with spring-loaded contacts for measurements in busbars or in arc extinguish chambers. Two other kits with crocodile clips (with current and potential wires) for circuit breakers of up to 10 kV, circuit breakers of up to 110 kV, and a part for circuit breakers of up to 220kV. Three kits that include cables with crocodile clips (with current and potential wires), a cable with a G-clamp (with current and potential wires). They differ in length and purpose, namely: for HV circuit breakers of up to 220kV, for HV circuit breakers of up to 330kV, some for 500kV, and for HV circuit breakers of up to 750kV. Test cables for precision measurements and measurements on the circuit sections with the test current is applied to their end points. Test block of MIKO-21 SKB039.00.00.000 Instrument and covering documents: Calibration Certificate, User's Manual, and a Log Book. Set #2 SKB039.27.00.000 Current cables 2x2m (1.12 kg) with crocodile clips (jaw up to 50 mm) for circuit breakers of up to 10kV. Mains cable SKB018.09.00.000 Mains cable 1 x 2 m. Weight 0.24 kg. For instrument connection to the power line. Temperature range -25°С ÷ +120°С. Rubber insulation. Ground cable SKB010.01.00.000 Ground cable 1 x 1.75 m. Weight 0.07 kg. For instrument grounding. Terminated with a G-clamp and a lug for a screw. Rated current – 50А. Shunt Type: 75ShSM M3 (75ШСМ М3). For checking MIKO-21 operability. Safety devices Type: VP2B-1V-2A (ВП2Б-1В-2А) (2 pcs). For the power source protection. Tool bag SKB126.06.00.000 Convenient, robust, wear proof bag for transportation of cables, documentation and other accessories to MIKO-21. SKB039.19.00.000-01 Current cables 2x1.5m (0.87 kg) with spring-loaded needle-type contacts for measurements in busbars or in arc extinguish chambers. Current range up to 200A. Set #3 SKB039.25.00.000 Current cables 2x4.5m (3.79 kg) with a G-clamp (jaw up to 80 mm) for all the circuit breakers of up to 35kV, and for some circuit breakers of up to 110kV. Set #4 SKB039.26.00.000 Current cables 2x6m (2.83 kg) with a G-clamp (jaw up to 80 mm) for all the circuit breakers of up to 110kV and some circuit breakers of up to 220kV. SKB039.24.00.000-02 Test cable with crocodile clips A25C (2 pcs) and a probe (2 pcs) for precision measurements and for measurements on the sections of the circuit to the end points of which the test current is applied. In particular, the cable can be used in case of measuring cables resistivity. Test kit for circuit breakers of up to 220kV. Current cable 1x1m (0.5 kg) with crocodile clips (jaw up to 50 mm). Current cable 1x3m (1 kg) with a G-clamp (jaw up to 70 mm). Test kit for circuit breakers of up to 330kV, and some for up to 500kV. Current cable 1x6m (2 kg) with a G-clamp (jaw up to 70 mm). Test kit for circuit breakers of up to 750kV. Current cable 1x9m (4 kg) with a G-clamp (jaw up to 70 mm). Potential spring-loaded contact (2 pcs.) SKB023.21.00.000 Together with Sets ##3-7 for avoiding high transient resistances between an input pin and a cramp of the device. Potential pin contact (2 pcs.) SKB023.22.00.000 Together with Sets ##3-7 for avoiding high transient resistances between an input pin and a cramp of the device. SKB110.41.00.000-02 The rod is designed to ensure convenient connection to contacts of a high-voltage item. MIKO-21 is included in Russian Register of Innovative Products under #272, valid until 30.03.2019. MIKO-21 is included in Russian State Register under #63180-16, valid until 17.02.2021. MIKO-21 - EAC № RU Д-RU.ME97.B.00047; valid until 26.04.2020. In 2016, following the request of OJC MVZ named after M.L. Mil, SKB EP, LLC developed a new line of MIKO-21 microohmmeter specifically for solving the tasks of our Company. Wire terminations in cap fittings and couplings. Test operation of MIKO-21 in 2016 revealed certain drawbacks in the device’s design and software that were completely eliminated by the Manufacturer. Since 2017 the MIKO-21 of special complement has been regularly used by JSC MVZ named after M.L. Mil and proved to be an instrument reliable and convenient in operation that fully replaces similar obsolete devices. The main merit of MIKO-21 microohmmeter is its simple and understandable interface, sensor display, small size and low weight, options of being powered from 220V, 50 Hz networks and from an in-built battery. There were no failures during the period of its operation. In the first quarter of 2017, ELMASH (UETM), LLC (Yekaterinburg City), a research and testing division of BBA Production Complex performed pilot operation of MIKO-21 microohmmeter manufactured by SKB EP, LLC. The microohmmeter was used for measuring the transient resistance of the main circuits of high-voltage column-type and bulk-oil circuit breakers of ВГБ-УЭТМ®-35, ВГТ-УЭТМ®-110, ВЭБ-УЭТМ®-220 types. We should like to note the following merits of the microohmmeter: simple and user-friendly interface, touch display, small size and light weight, availability of the option of connecting the device to PC. Microohmmeter can be powered both from the 230V network and from an in-built battery that is a big advantage since devices are often used far from the available power sources. The device’s kit allows a large variety of options. During pilot operation the microohmmeter proved to be a reliable and convenient device. There were no failures observed. On July 1-2 Dimitrovgradsky metallurgical plant, LLC was testing the MIKO-21 microohmmeter. The instrument was used for measuring the electric resistance of copper items. MIKO-21 is a convenient multi-functional instrument with user-friendly menu. One of its merits is a large range of manually set values of test current and an option of data downloading to PC. Touch color display, an archive of passport values of tested equipment, independent power supply and small size are also worth mentioning. The instrument demonstrated proper operation, there were no failures. That PAO FSK EES Branch operates the following instruments: MIKO-1 (16 pcs. ), PKV/M7 (6 pcs. ), PKV/M6 (4 pcs. ), PKV/U3.1 (1 pcs. ), MIKO-21 (1 pcs.). First instruments were procured in 2010. The instruments were used for monitoring and diagnosis of electric equipment at 220 and 500 kV substations. MIKO-1 device is rather convenient in use as it is powered from an in-built battery; it has small weight and size. It can be easily connected to any measured equipment owing to cable with clamps of two types. The process is easily controlled, measurements are of high accuracy; capacity of the in-built battery is sufficient for a large number of measurement sessions. We used PKV/M6 and PKV/M7 instruments for recording the time and speed characteristics of circuit breakers U-110, MKP-110, U-220, VMT-110, VMT-220, MKP-35, C-35, and of 6-10kV oil circuit breakers. The process of connection and diagnosis is rather simple. We recommend PKV/M6 and PKV/M7 instruments to all the companies dealing with maintenance and operation of electric equipment and to electric network companies. 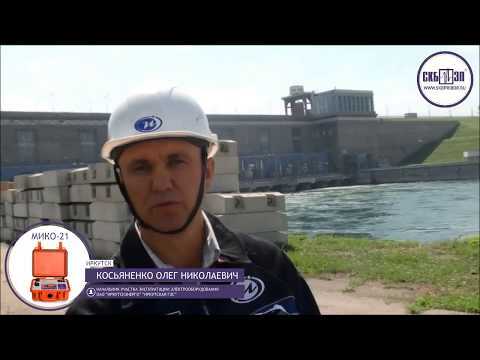 At the end of July field tests of a new microhmmeter MIKO-21 were carried out on Irkutsk Hydroelectric Power Station High-Voltage Electric Equipment Site.